Learn about the man who influenced the look of early Disney animated features and illustrated the bestselling children’s book of all time. Tenggren’s Post cover for November 17, 1956. But what made Gustaf Tenggren uniquely qualified to illustrate this particular cover? Like his cover, Tenggren combined qualities from very different worlds. Born in 1896, he grew up on a remote farm near Västergötland, Sweden. His father abandoned the family, leaving the boy to spend an impoverished childhood with his grandfather under primitive conditions and with few childhood friends. Yet by age 25, he was a successful illustrator in Manhattan. He then moved to Hollywood, where, combining the worlds of art and science, he played a key role in the birth of feature animated films for the fledgling Walt Disney Company. He was also the illustrator of the top-selling children’s book of all time, The Poky Little Puppy. Tenggren eventually left the Disney studio because of artistic differences with Walt Disney. He lived in many places before settling down to live his final days on a farm in Dogfish Head, Maine, because it reminded him of the Swedish countryside. And that’s where the Post found him. On June 22, 2017, Tenggren, who died in 1970, was inducted into the Society of Illustrators Hall of Fame. Hall of Fame dinner at the Society of Illustrators, June 2017. (Photo by Jason Goodfriend, courtesy of the Society of Illustrators)</em. Within two years, Tenggren moved to New York City. The boy who grew up on an isolated, rocky farm in Sweden loved the big city: “For many years my studio was in this great city. Work was plentiful and during this period I illustrated a number of children’s books.” Tenggren became a well-known book illustrator, working on classics like Mother Goose, Hans Christian Andersen, and Heidi. He illustrated at least 22 books between 1923 and 1939. He also illustrated fiction and advertisements for magazines. In 1934, Tenggren encountered a talent scout for Walt Disney, who was searching for artists to work on the world’s first full-length animated feature film, Snow White and the Seven Dwarfs. Tenggren jumped at the chance and moved out to California in the early spring of 1936 to start work as an art director on Snow White. Before any actual story work was begun, Walt would look for an artist of unique ability to make some drawings or paintings that would excite everybody. … He brought in top illustrators of children’s books, such as … Gustaf Tenggren to explore the visual possibilities of a subject. … These inspirational sketches started the whole staff thinking. Tenggren drew upon his childhood experiences with his grandfather for some of the most dramatic scenes, including the rustic cottage of the seven dwarfs, the deep woods where Snow White flees from the hunter and the evil queen’s laboratory where she concocts the poison apple. Filmgoers today may forget the significance of Snow White, but film critic and historian Roger Ebert wrote, “Snow White and the Seven Dwarfs was immediately hailed as a masterpiece. (The Russian director Sergei Eisenstein called it the greatest movie ever made.) It remains the jewel in Disney’s crown.” Technologically, Disney’s rich, colorful films were a great leap forward in expressive imagery. The look of Pinocchio, on which he was engaged during the major part of 1938, owes much to Tenggren’s creative input. The interiors and exteriors, the Tyrolean clothing, the craftsman’s workshop, the painted dolls and toys and the decorated and carved wood work were all heavily influenced by the conceptual drawings Tenggren worked on while the film was in production. 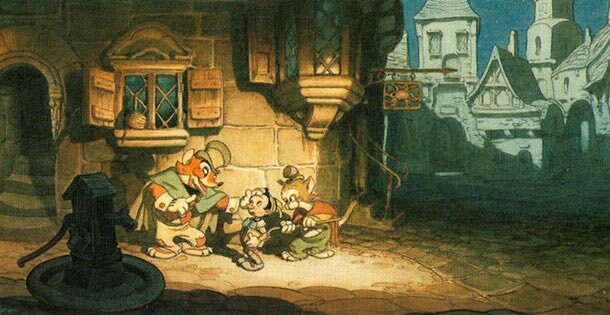 Tenggren’s beautiful watercolors of the small towns with carved wooden beams and furniture, Geppetto’s workshop with its cleverly painted surfaces, and the underwater scenes remain some of the highlights of Disney’s art. Tenggren also worked on the “Sorcerer’s Apprentice” section of Fantasia and on shorter cartoons, such as The Ugly Duckling, The Old Mill, and Hiawatha. Shortly after Disney started work on Bambi, he and Tenggren parted company. In 1940, Tenggren produced his first children’s book bearing his own name, The Tenggren Mother Goose. This was followed by books such as the Tenggren Tell-It-Again Book, Tenggren’s Storybook, Tenggren’s Farm Stories, Tenggren’s Folk Tales, and Tenggren’s Pirates, Ships and Sailors. These books were highly popular. Tenggren and his wife were able to spend time traveling in search of a home where they could finally put down roots. They tried Mexico, Florida, and Cape Cod before deciding upon a farm in Maine, which they furnished with Swedish antiques. Among his most important and best received projects during this period were Tenggren’s Golden Tales from the Arabian Nights which employed rich decorative middle eastern patterns in vivid images and The Canterbury Tales, which updated Chaucer’s classic for children. But he was best known to the general public for his series of Little Golden Books. He illustrated 28 books in this series between 1942 and 1962, including the classics The Poky Little Puppy, The Saggy Baggy Elephant, The Shy Little Kitten, The Big Brown Bear, and The Little Trapper. The prolific Tenggren continued to work from his home in Maine until his death from lung cancer on April 6, 1970. Tenggren’s induction into the Illustration Hall of Fame confirms his key role at the dawn of animation and the importance of his many illustrated children’s books. His imaginative creations will long be remembered and enjoyed by audiences around the world.